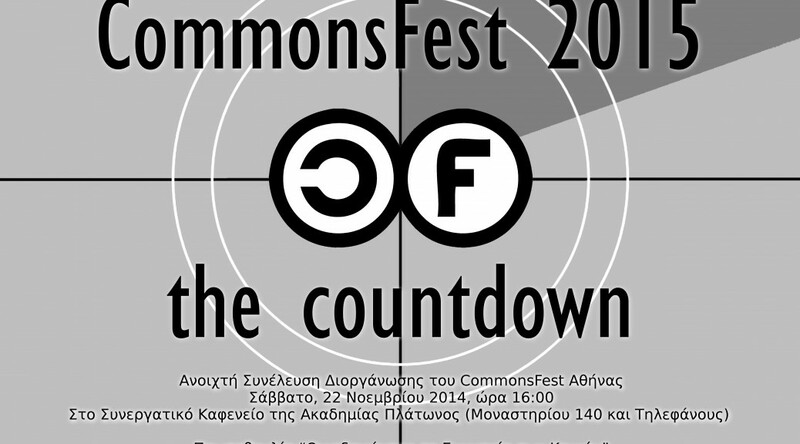 After the open call for the organization of the 3rd CommonsFest at Heraklion, now comes the 1st open call for organizing CommonsFest in Athens in 2015. We wish a good start and we hope CommonsFest to travel in more cities in Greece and the rest of the world. 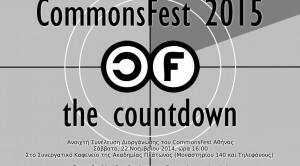 CommonsFest was held the last two years with great success in Heraklion, Crete. Through presentations, discussions and workshops it was clear that Commons establish an organizational sphere of human activity, characterized by fair and equitable benefit from participation and self-government. As part of the initiative “Building an Alliance for Commons” born for the first time in the second CommonsFest at Heraklion Crete in May 2014, participants decided to organize CommonsFest in Athens too in May 2015. With open procedures we invite you Saturday, 22nd of November, 2014 at 16:00 in Cooperative Cafe at Plato Academy (Monastiriou Tilefanous 140) in a first open call for creating the organizational team, which will organize the festival. Come to co-organize a festival of resistance and creation with social ventures, which operate in a wide range of covering needs, from management of the digital commons to the necessary for life natural resources, projects dealing with sustainable forms of agriculture, with the retention of agricultural biodiversity, free broadband wireless networks, networks of solidarity that offer primary healthcare services, natural building methods, the approach of self-sufficiency through examples of home economics, alternative governance models, actions to safeguard the cultural commons, free software for the safe and effective management of information, new forms of collaborative innovation and knowledge sharing, citizen journalism, community supported agriculture, initiatives on digital freedoms, new forms of financing, the autonomous power supplies from renewable energy sources and open licenses for creators. CommonsFest shows the way to create the world we want in the world that we want to overcome! CommonsFest is an initiative for the promotion of free knowledge and peer collaboration for the creation and management of the Commons. A philosophy which is widespread through communities of free software and extends to many aspects of our daily lives, such as the arts, government, hardware, tools and other goods. Previous PostKnowledge as a common good. Communities of production and sharing in Greece. (Full documentary)Next PostTrailer. Building Communities of Commons. A documentary on Networks in Sarantaporo area. The pple of Athens would have often escaped from their government had it contained a safeguard against tyranny of its own passions!